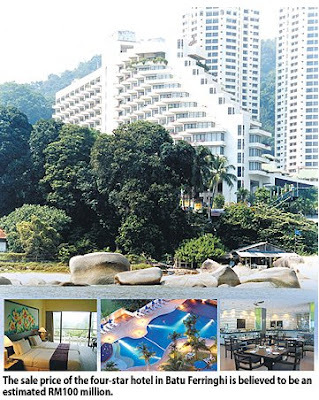 The four-star Hydro Hotel Penang in Batu Ferringhi is up for sale for an estimated RM100 million, sources say. The property, previously known as Hydro Majestic Hotel and before that Ferringhi Beach Hotel, was bought by the Mah family of Penang in early 2006 from Asia Pacific Land Bhd. The 350-room property, now 28 years old, was bought for RM43 million. It is understood that Hydro Hotel underwent a RM20 million facelift after the acquisition. The Mah family, whose activities include property development, has been in the hotel business for over 10 years, with hotels in Australia and China. Nick Mah Siew Chean, the executive director of his family's group of companies which include the Mercure Majestic Hotel in Kunming, did not deny that the property was up for sale when contacted several weeks ago. He said that it was willing to consider the sale if the price was right. One source said that the owners had voiced their intention to sell the property almost a year ago and that several potential buyers had viewed it. However, Business Times could not reach Nick yesterday. A few years ago, the family bought the abandoned hotel building in Jalan Kia Peng, Kuala Lumpur, completed it and ran it as the Novotel Hydro Majestic. The hotel was later sold to Pulai Springs Bhd. In April this year, Pulai Springs, of which Nick is the executive director, sold the Novotel Hydro Majestic to The Nomad Residences Sdn Bhd. SINGAPORE: Kuala Lumpur, Johor Baru and Georgetown are among the cities earning the reputation as most expensive in Asia, according to a latest cost living survey. KL is ranked 38th, JB 40th and Georgetown 42nd, said the survey on the 50 most expensive cities in Asia carried out by ECA International for 2009. Globally, KL is ranked 210, JB 216 and Georgetown 218. ECA, the world's leading knowledge and solutions provider for international human resources professionals, said strong currencies were pushing up the cost of living in Asian locations. It said Tokyo remained the most expensive city in Asia, due largely to the appreciation of the yen against other major currencies, and joining the Japanese capital in the region’s top ten are Beijing (ranked 5th) and Shanghai (6th) as well as Hong Kong (7th) and Singapore (10th). ECA regional director for Asia, Lee Quane, said the strengthening of Asian currencies was the dominant factor contributing to the region being more expensive for visitors than it was 12 months ago. He said during the period, the yuan continued to strengthen while the yen had appreciated by almost eight percent against the US dollar, and many western currencies, including sterling, the euro and the Swiss franc, had weakened. ECA carries out a Cost of Living Survey twice a year comparing a basket of commonly purchased consumer goods and services in over 370 locations worldwide. ECA said Singapore had moved into the top ten most expensive locations within the region in spite of its weakened currency. Malaysia had increased at half last year’s pace, in Singapore the rate was down by just 25 per cent. Furthermore, currencies of locations previously more expensive than Singapore, notably London, Stockholm and Istanbul, had depreciated at an even faster rate than the Singapore dollar, he said. These factors had contributed to Singapore becoming more expensive for visitors than many of the other locations in the survey, Quane added. ECA also said the depreciation of the ringgit had made the cost of living cheaper for assignees heading to Malaysia. The Mongolian capital, Ulaanbaatar (ranked 51), is the cheapest location in Asia, with goods and services approximately a third of the cost there than when purchased in Tokyo. Overall, the city of Luanda in Angola kept its rank as the most expensive city in the world followed by Tokyo, and Maseru, Lesotho is the cheapest. The Penang government's move to take a firm stand in deciding once and for all the fate of four property developers who were said to be affecting George Town's status on the World Heritage List is commendable. By deciding that all development projects within the heritage core and buffer zones must stick to an 18m or five-storey height ruling ahead of a United Nations Educational, Scientific and Cultural Organisation (Unesco) meeting in Spain next week (where the George Town issue is to be discussed), shows that we have not ceded our "sovereignty" to the UN body in deciding how development in our country and cities should proceed. For the four affected developers - Asian Global Business (AGB) Sdn Bhd, Boustead Holdings Sdn Bhd, Eastern & Oriental Sdn Bhd and the Low Yat Group - the final decision that they must adhere to is one which may be a bitter pill to swallow. Four firms had approvals from the Penang Island Municipal Council for projects exceeding the 18m limit well ahead of the date when George Town got its place on the World Heritage List in July 2008. AGB's project is the Pier Hub @ Weld Quay, while Boustead is developing the Boustead Royale Bintang Hotel behind the general post office in Lebuh Downing. Eastern & Oriental is building an extension to the E&O Hotel while Low Yat plans to build a 23-storey hotel on Jalan Sultan Ahmad Shah, both in the buffer zone. It has not been an easy ride for these companies since last November, when a bombshell was dropped that their "offensive" projects were now going to be a likely reason for George Town to be de-listed from the prestigious heritage map. Besides having to contend with nervous and irate bankers, along with an army of demanding shareholders, these companies also had to deal with many trying situations on the ground in Penang, including heritage and conservation activists who have been very vocal in protecting the heritage city's listing status. Today's state government "inherited" the problems which came in approvals granted to the three companies by the former administration. The mind boggles at how the three companies could be allowed to circumvent the five-storey height restriction which that same government had crafted as part of its heritage guidelines when applying for listing status. The previous administration must assume some measure of responsibility for the situation the three companies have found themselves in. The current state leadership is not entirely blame-free either, since they were instrumental in granting the green light to the Low Yat group to proceed with its high-rise project by simply following a precedent set for the three companies . There should no longer be empty promises made to investors by saying that "everything can be settled" and then leave these companies to sort things out. Local authorities like the municipal council must be empowered to make decisions with no political interference, if Penang is serious in wanting to continue rejuvenating itself as an investment destination of choice. It is not known if there are major financial casualties yet on the four firms caused from the uncertainly of the past months and the fact that some will now have to scale down their projects, re-position their products or in the case of one, abort their plans altogether. Looking ahead, there is now an urgent need for a clear-cut blueprint on how the four development projects and subsequent ones in the heritage city are to be carried out. Transparency by all parties is also key if the state is serious in wanting to keep George Town's place on the heritage list. It is apparent that the state government has decided to take into consideration an extensive mission report which has been compiled by two Unesco experts who visited Penang recently. Among them is a suggestion that Malaysia introduce new legal provisions for the protection and management of its World Heritage sites. Apart from stating in no uncertain terms that the AGB and Boustead projects must be scaled down in height, the report also recommends that efforts be made to reduce the impact of the E&O and Low Yat projects which lie in the buffer zone. The question now is: Since the state has more or less "resolved" the outstanding concerns of Unesco about George Town's heritage enclave, is there a necessity to be spending public funds and have two Penang Island Municipal Council officials flying to Seville in Spain this month to attend the Unesco Heritage Committee meeting? MERSING: Radian Starfish Sdn Bhd will develop Laguna Marina, a RM3bil integrated development on the seafront of Mersing. The development, which has received the Department of Environment approval, involves land reclamation of 809.37ha scheduled to start this year. “The project is expected to take 10 years to complete,’’ Johor Mentri Besar Datuk Abdul Ghani Othman said. He said this after the inaugural meeting of Johor’s Implementation and Coordination Committee (ICC) under the East Coast Economic Region (ECER) development master plan. Ghani is also chairman of the ICC, which oversees the implementation of projects in Mersing which is part of the ECER, which also covers Pahang, Terengganu and Kelantan. He said the waterfront development would consist of star-rated and boutique hotels, waterfront homes, a water theme park, convention centre, cultural centre, private medical centres as well as commercial and business areas. He said Radian would build a jetty complex for a new ferry service that would operate 24 hours and able to handle large capacity vessels, as well as a fishing jetty. Ghani declined to divulge any information about Radian, which he said was a local property developer. “Soon-to-be-launched tourism-related projects as well as the planned infrastructure development will transform Mersing into an even more popular tourist destination,’’ he said. Mersing is the gateway to islands such as Pulau Tengah, Pulau Sibu, Pulau Rawa and Pulau Tioman. It is also the main eco-tourism gateway for the Endau-Rompin National Park. Ghani said the Federal Government had allocated some RM215mil under ECER for three infrastructure projects in Mersing this year. These include RM200mil for the construction of a 68km coastal road linking Mersing to Kg Sedili, RM12mil for the upgrading of a 56km track between Kg Kahang and Endau-Rompin National Park, and conversion of the roundabout in Mersing town into a traffic light intersection. SINGAPORE: A consortium comprising City Developments (CityDev), Dubai World and El-Ad Group said yesterday it had successfully refinanced a US$1.2 billion (US$1 = RM3.52) loan to develop a commercial project in downtown Singapore. The consortium will raise the new funds via a S$800 million (S$1 = RM2.41) syndicate loan and S$400 million in secured convertible notes, the South Beach consortium said in a statement. Singapore-based CityDev, southeast Asia’s second-largest developer, will take up S$195 million of the convertible notes.